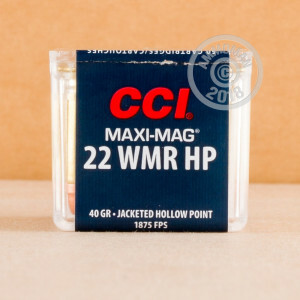 CCI’s Maxi-Mag line of 22 WMR ammunition boasts a startlingly fast muzzle velocity of 1,875 fps. With so much energy this round reliably delivers a laser-like trajectory that you’ll find of tremendous value no matter what you’re planning on doing with your rifle. This cartridge features a 40 grain projectile. The bullet sports a sturdy jacket, which in conjunction with the round’s clean burning propellant will help to keep your weapon clean and in less need of frequent cleaning. The hollow point bullet delivers catastrophic terminal performance, making this the round to chamber when you’re in pursuit of prairie dogs, squirrels, and other pesky varmints you’d rather not see in your fields. 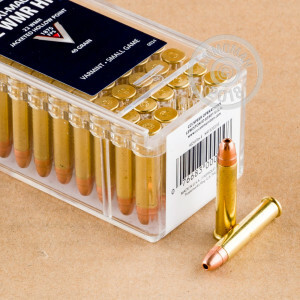 These 2,000 rounds also offer reliable CCI primers and corrosion resistant brass casings, which together make them more than content to sit and wait until you’ve come up with a worthy use for them.